actual combat, but I have my doubts. for 10 years and that she could remember him running for office every year. 10-11-1938. She was living at 840 Washington St. in Hollister at the time. Hard Blows -- Some people may entertain the idea that the position of a night watchman is one of ease and comfort. If any one hereabouts has such a notion, he should try the occupation a few nights. We know not how night officers act in other towns, but we dow know that officer Austin has experienced several rough times in the discharge of his duties as an officer. Last Saturday night he was compelled to use severe force in quelling a turbulent spirit, and in the fracas he recieved a painful injury to one of his hands, which has caused him much trouble since. Last Sunday night he again came in collision with a fighting character, and was forced to throw the man and threaten to use the club before the law-violator would act peacefully. In such cases as these, the officer would be justifiable in giving the resisting men a decoction of hickory and handcuffs. We do noth uphold any officer in abusing a criminal, but we believe that when a man attempts to injure an officer when making an arrest, that a genuine blow over the head should be administered. Mr. Austin is a most careful officer, but he always captures his man, and he fears none. G.W. Austin to A.H. Fredson, house and lot on San Benito street. Geo. Austin left last Tuesday morning on a business trip to Fresno, accompanied by G.M. Roberts. The members of the Jesse I. Reno Post. No. 58 have elected the following officers: Wm Eastman, P.C. ; Wm Cashman, S.V. ; G.W. Austin, J.V. ; F.W. Oliver, Adjt; H. Snibley, Quartermaster; J.W. Spader, O.D. ; John Young, O.G. ; D.K. Sanford, Chaplain; Q.V.R. Serles, Surgeon; H.M. Campbell, S.M. ; D.F. Gray, Q.S. Tres Pinos. We see the Tres Pinos schoolhouse is radiant ina new coat of paint, and the new fence is quite an improvement. It was moved from the street in which it stood by Mr. Geo Austin. For two years past B.F. Ross has held the position of Marshal of the Town of Hollister. His term expires in May, at which time a new Marshal will be elected. Mr. G.W. Austin announces himself as a candidate for this important office. Mr. Austin is well known by all our people, and has obtained already a good reputation as an officer. In 1882 he was appointed night-watchman, the following year he was elected Marchal. For 3 succeeding years he was re-elected Marshal. W.W. McDonald is a first class man, and no doubt would have made a good Marshal but Austin received 190 votes while McDonald could only scare up 101. Frank Ross was elected marshal last year because all the roughs and toughs in town from R.R. Brown down or rather up, through the whole category of dead beats, pimps and drunks supported him. They elected Ross last year, and Mac thought as long as they stood in with him, he could get enough of the respectable element to pull him through. Alas! he reckoned without the cost, and the result is he got soup. Is Marshal Austin going to run the toughs, or will the toughs run the Marshal? Up to date the Marshal has run the toughs, and it is to be hoped will continue to do so. On Saturday three of Jon Cullen's men came into town and proceeded to get drunk. Marshal Austin arrested the worst one and told Joe Perez to put the team up. When Joe attempted to do this, the two who were left seized him by the legs and made him turn a somesault out of the wagon onto the ground. For this effort the remaining members of the trio were allowed to explore the mysteries of the calaboose. On Sunday morning John Cullen came to town, paid the fines of his men, and then got drunk, was arrested and locked up in the calaboose along with one of the men whose fine he had just paid. Early in the spring of 1864 the government of the Northwestern States, namely: Ohio, Indiana, Illinois, and Iowa, believing that the rebellion was nearing its close, and desiring to aid the Government in every way possible, tendered to the President a volunteer force of 85,000 one hundred-day men, to relieve the veteran soldiers from guard duty at our forts, arsenals and elesewhere. Of this number Illinois furnished thirteen regiments and two battalions. "Our regiments under this call performed indispensable and invaluable services in Kentucky, Tennessee and Missouri, relieving garrisons of veterean troops who were sent to the front, took part in the Atlanta campaign, several of them also composing a part of that glorious army that has penetrated the very vitals of the rebellion and plucked some of the brightest laurels that this heroic age has woven for a patriotiic soldier. Five out of the one hundred-day regiments, after their term of service had expired, voluntarily extended their engagements with the Government, and marched to the relief of the gallant and able Rosecrans, who, at the head of an inadequate and poorly appointed army, was contending against fearful odds for the preservation of St. Louis and the safety of Missouri. The officers and soldiers of these regiments evinced the highest soldierly qualities and fully sustained the proud record our vetrans have ever attained in the field, and the State and Country owe them lasting gratitude, and we have in a great degree to attribute our success in Virginia and Georgia to the timely organization and efficient services of the one hundred-day volunteers furnished by all of said States. The President has, by order, returned them the thanks of the Government and the Nation for the service thus rendered, and accords the full measure of praise to them as our supporters and defenders in the rear, to which the regular reserve force of large armies are always entitled." The One Hundred and Thirty Seventh Infantry Illinois Volunteers was organized at Camp Wood, Quincy, Ill, by Colonel John Wood, and was mustered in June 5, 1864, for one hundred days. On June 9, 1864, the Regiment left Quincy, and proceeded to Memphis, Tenn., where it was assigned to the Fourth Brigade, District of Memphis, Colonel E. L. Baltwick, Thirty-ninth Wisconsin commanding. On July 9, assigned to Third Brigade, Colonel John Wood commanding, and was stationed on the Hernando road, on picket duty. The Regiment was mustered out of the United States service at Springfield, Ill, September 4, 1864. 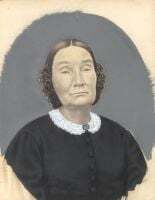 [S8] 1850 United States Federal Census, Ancestry.com, (Provo, UT, USA: The Generations Network, Inc., 2005), Ancestry.com. 1850 United States Federal Census [database online]. Provo, Utah: MyFamily.com, Inc., 2005. Original data: United States. 1850 United States Federal Census. M432, 1009 rolls. National Archives and Records Administration, Washington D.C. Not Stated, Hancock, Illinois, roll M432_109, page 334, image 132. [S203] Report of the Adjutant General of the State of Illinois, Volume VII, Brig-Gen J.W. Vance, (Springfield, Illinois, 1886), Name & Rank: Austin, George W, Private. Residence: Bushnell. Date of rank or enlistment: May 11, 1864. Date of muster: June 5, 1864. Remarks: Mustered out Sept 24, 1864., Page 103. [S749] Married Austin-Rue, â€œGeo Austin of Thayerâ€�. [S204] 1916 Great Register of San Benito County, #4, Austin, George W, Carpenter, Republican. 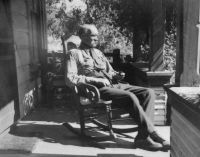 [S145] 1906 Great Register of San Benito County, #1, Austin, G.W., Age 58, Occupation Carpenter. [S64] Hollister Freelance, Died - Austin - at Sanger, Dec 23. Harrison Austin, a native of Indiana, aged 52 years (deceased was a brother of George W. Austin, formerly town marshall of Hollister, but now of Victoria BC, and L.B. Austin of Santa Cruz. He was once a resident of Hollister. Dropsy was the cause of death. 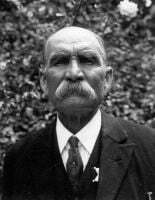 [S144] 1898 Great Register of San Benito County, Hall #3, Name: Austin, George Washington, Carpenter, Age 50, Height 5' 9", light complexion, blue eyes, light hair, From Illinois. [S13] 1900 United States Federal Census, Ancestry.com, (Provo, UT, USA: The Generations Network, Inc., 2004), Ancestry.com. 1900 U.S. Federal Census [database on-line]. Provo, UT: MyFamily.com, Inc., 2004. Original data: United States. 1900 United States Federal Census. T623, 1854 rolls. National Archives and Records Administration, Washington D.C. San Benito, California, ED 17, roll T623 97, page 8B. [S145] 1906 Great Register of San Benito County, #1, Austin, G.W., Age 58, Carpenter. [S14] 1910 United States Federal Census, Ancestry.com, (Provo, UT, USA: The Generations Network, Inc., 2006), Ancestry.com. 1910 United States Federal Census [database on-line]. Provo, UT: MyFamily.com, Inc., 2004. Indexed by ProQuest from microfilmed schedules of the 1910 U.S. Federal Decennial Census. Data imaged from National Archives and Records Administration. 1910 Federal Population Census. T624, 1,784 rolls. Washington, D.C.: National Archives and Records Administration. Hollister Twp, San Benito, California, ED 23, roll 93, part 2, page 30B. [S169] San Benito County Historical Society, Constable, Hollister Township: G.W. Austin, elected 5 Nov 1918, elected 7 Nov 1922 (deceased, J. Zimmer appointed). [S15] 1920 United States Federal Census, Ancestry.com, (Provo, UT, USA: The Generations Network, Inc., 2005), Ancestry.com. 1920 United States Federal Census [database on-line]. Provo, UT: Ancestry.com, 2005. Indexed by Ancestry.com from microfilmed schedules of the 1920 U.S. Federal Decennial Census. Data imaged from National Archives and Records Administration.1920 Federal Population Census. T625, 2,076 rolls. National Archives and Records Administration, Washington D.C.
[S173] San Benito County Burial, Removal & Transit Permits Issued 1874-1910, San Benito County Historical Society, Austin, GW, 9 Apr, 1848. Parents: F.B. Austin - Eleanor Whitten, Died of Carcinoma of colon + Bronchiatasis of left lung. Buried 16 Mar 1925 IOOF, Burial Permits Drawer, 1922-1926. [S54] California Death Index 1905-1929, AUSTIN, GEORGE W, Spouse initial=A M(Annie Maria), Age group = 1 (1-99 yrs), Age = 76, County = 35 (San Benito), Date = 3-14-25, Year filed with State = 25, Record ID = 13956 (hard to read last digit), Page 391.